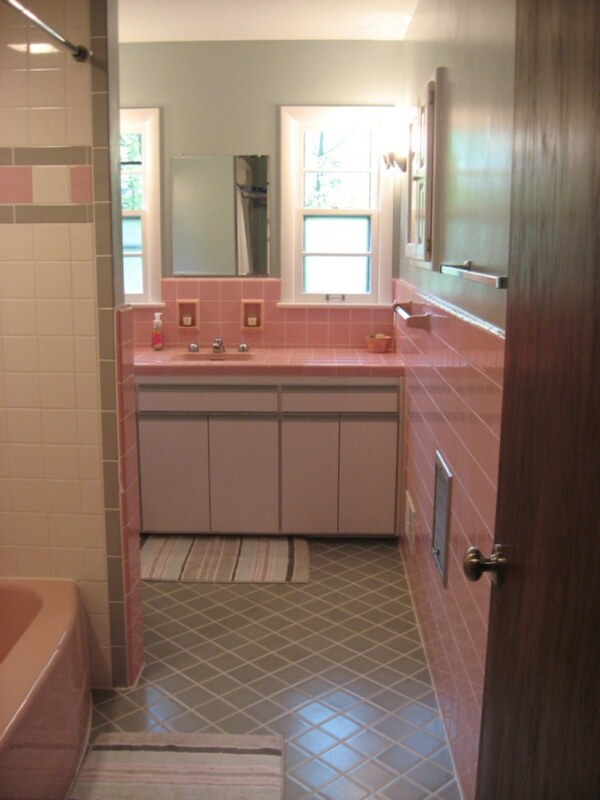 There are archeologists among us — and of course they love the treasures in their 1954 home, including photos from their 1954 home’s original construction… and their original pink bathroom. Valerie writes: . Matt writes: Wow Valerie! 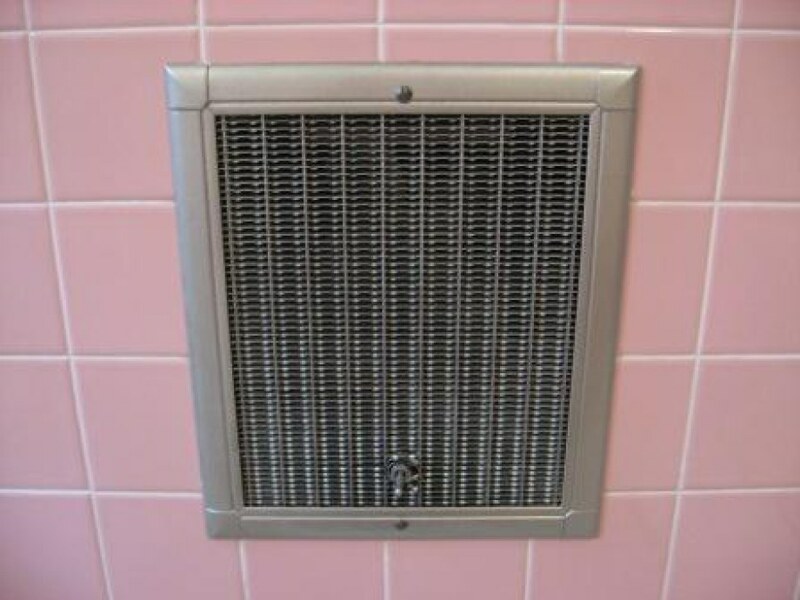 You’re daughters are right, you do have princess bathroom. It makes me so happy to know you and your husband are archeologists who are also retro renovators – what I wish to be one day. It’s great you’re so passionate about our past and its homes. You definitely made the right choice when it came to your house. 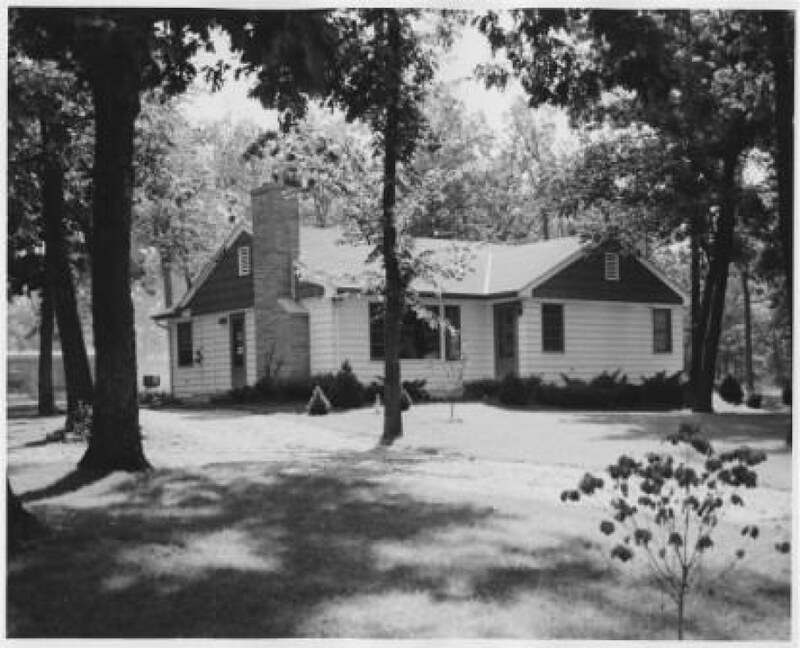 I completely agree with you that it is the character mid century home can have that makes them so desirable when it comes to choosing a new home. 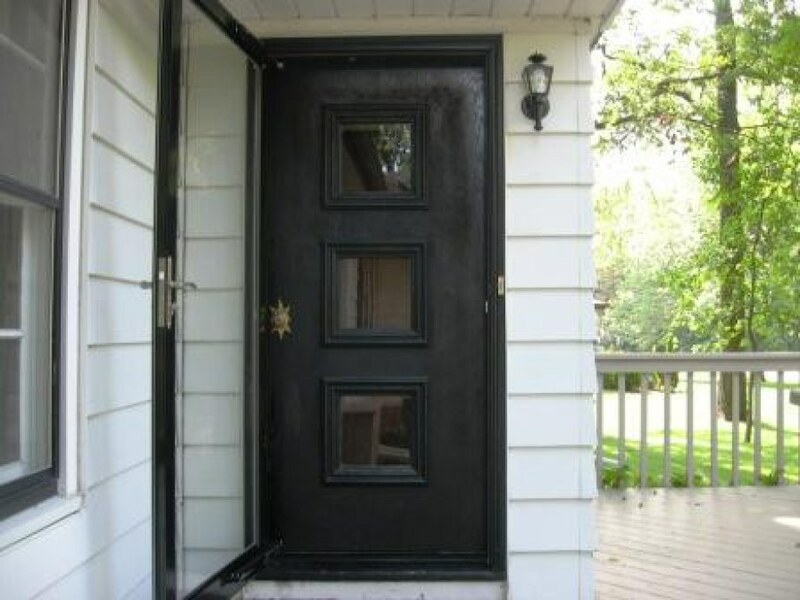 You won’t get that same vibe from a new home, and if you do you’ll be paying twice the price. 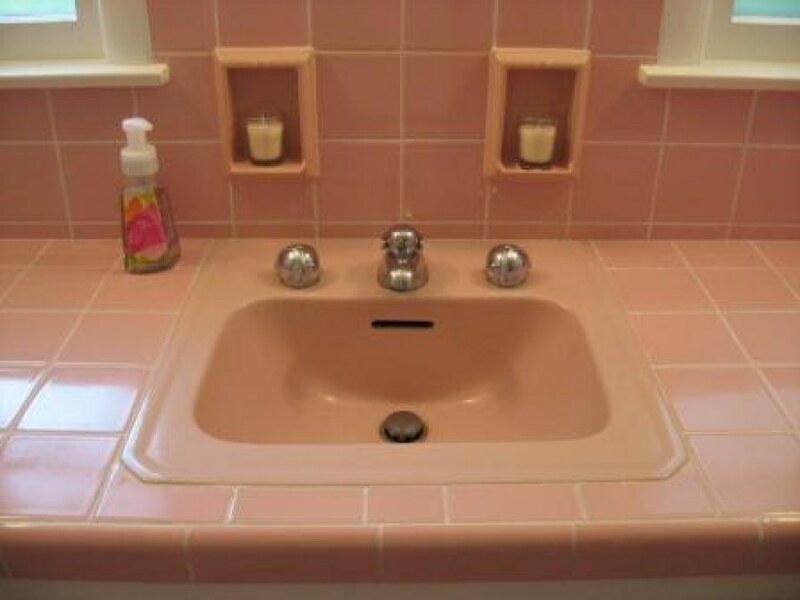 I love all your recessed soap dishes. 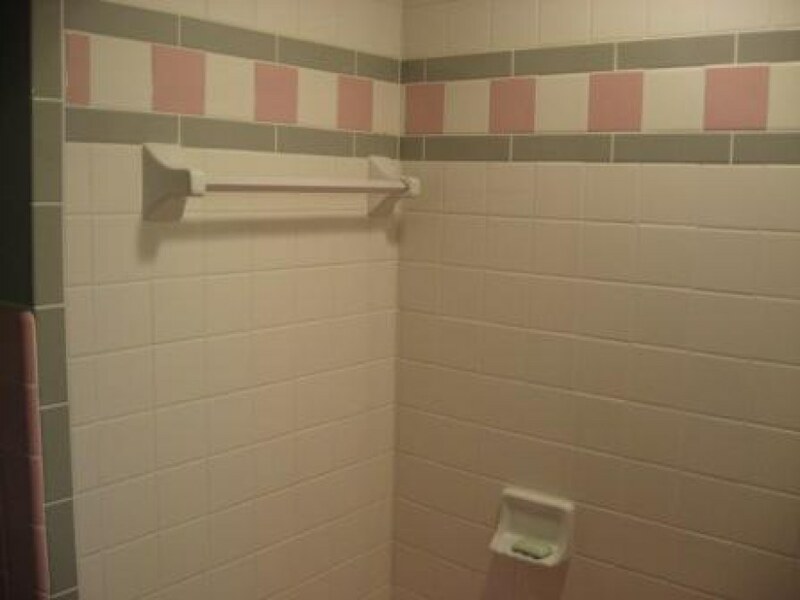 You may not think it at first, but the gray tile goes well with the pink. With all the good you got goin’ on, we won’t count the new vanity doors against you. 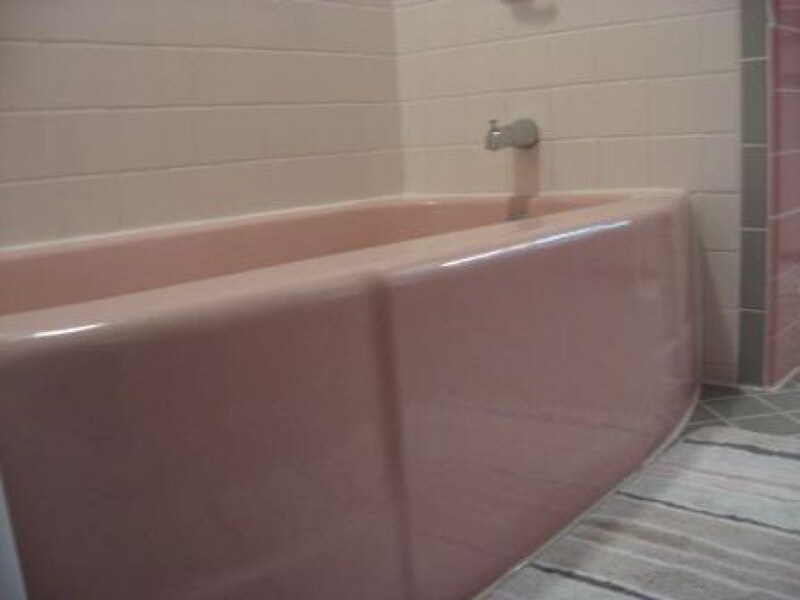 Pam adds: Yes, it appears the entire tub surround – white field tile with grey bullnose — is newer? 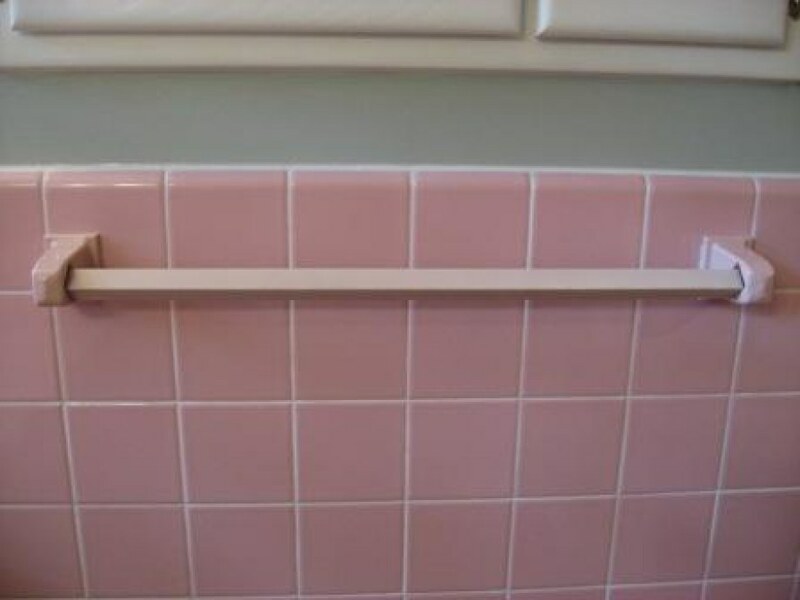 That said, the coordination with the pink is nicely done. To view slide show, click on the first thumbnail, and move forward or back via the arrows below each image. WOW! That is truly a beautiful home. 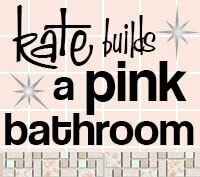 Even my husband said the pink bathroom was beautiful and he is not a lover of that color. Lucky!!! Thank you for all the kind comments! 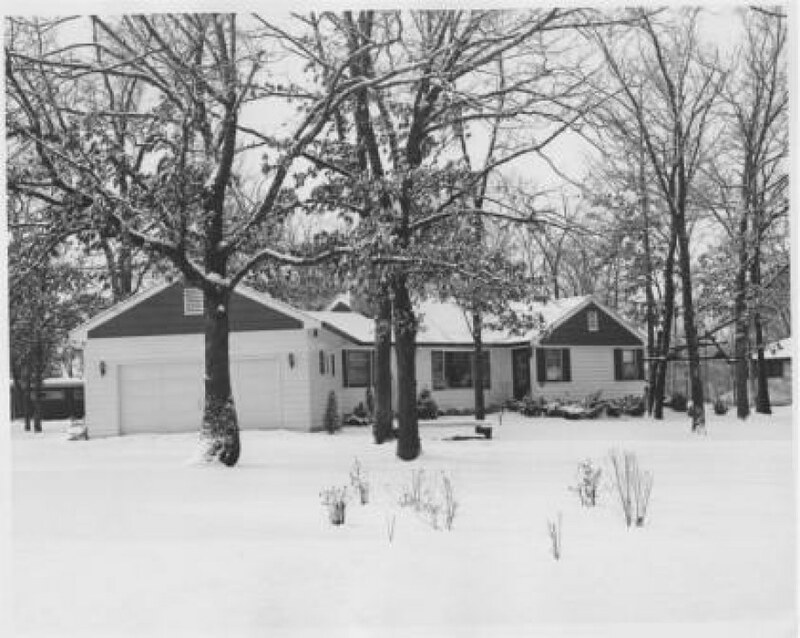 We were drawn to this house for lots of reasons with all the trees and windows high on the list. 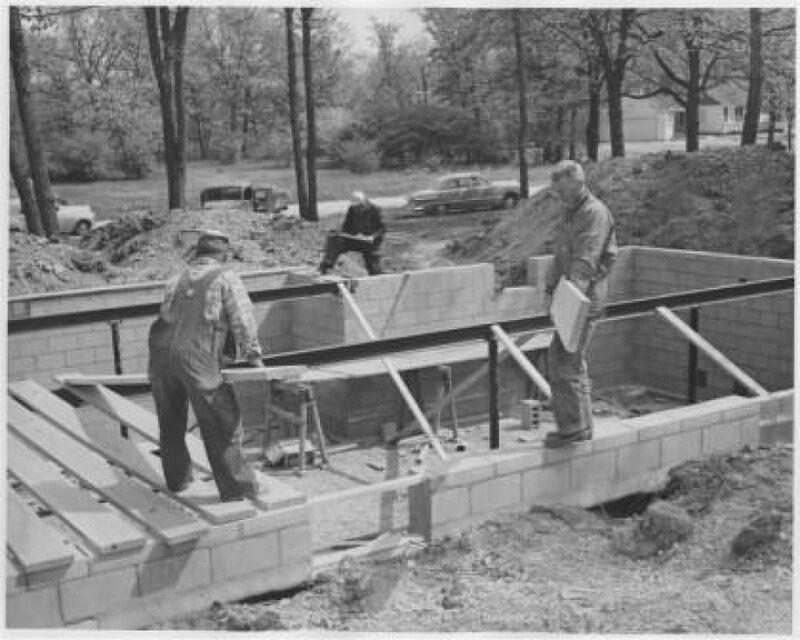 Our kitchen was redone around 1985 but it retains an efficient work triangle so we are only planning cosmetic changes there – new counters are my top choice. 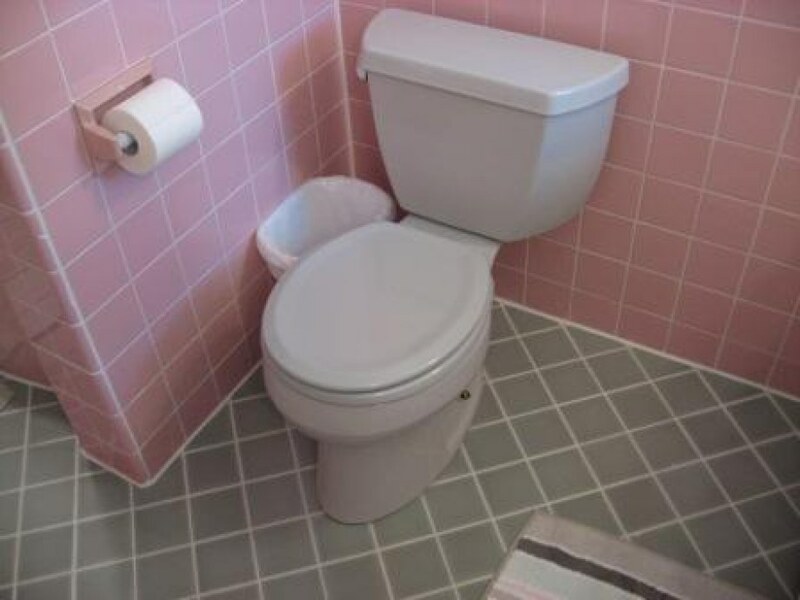 The pink bathroom is thrilling as is but I do want to research wallpaper options. We were surprised to learn that the house was not originally 3 bed/2 bath however that knowledge increases the significance of the exposed brick in the “new” master bedroom since it was the exterior of the fireplace during the home’s first incarnation! The appraisal report included a floorplan which I will scan and forward to Pam as soon as possible which will hopefully illustrate the addition’s flow. Have a great day! The pink and gray are so pretty together! 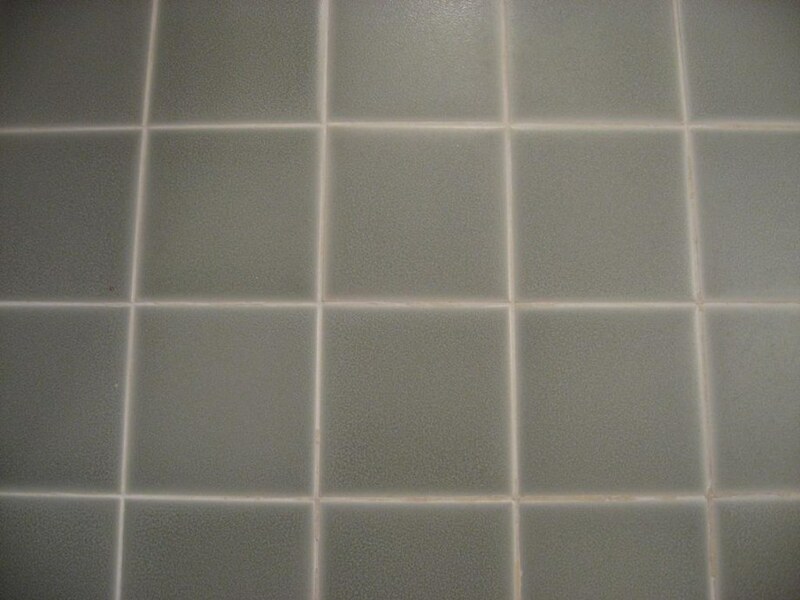 The grout looks pristine! Don’t you love waking up to those R2-D2 faucet knobs? Mine make me smile everytime! 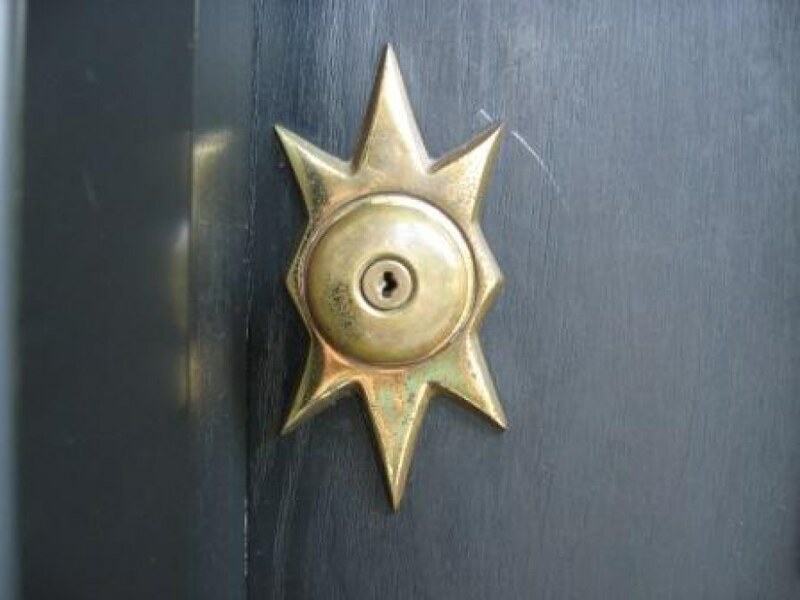 Awesome escutcheon around the keyhole! Thanks for sharing! LOVE the gray tile floor! 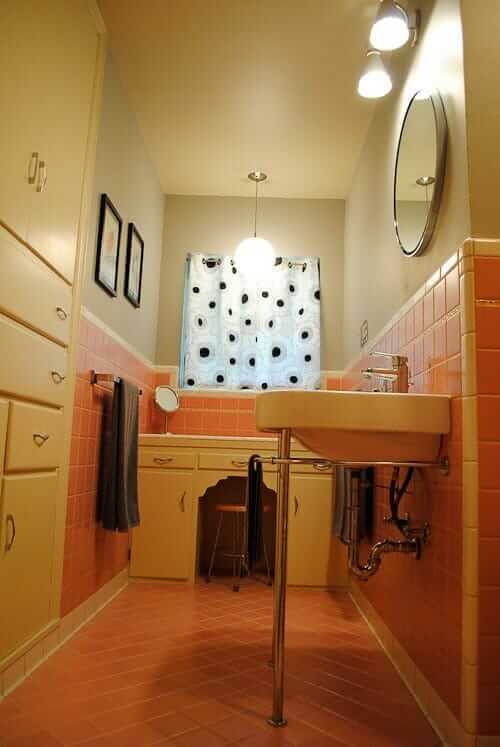 That bathroom is gorgeous! What a treasure you have! 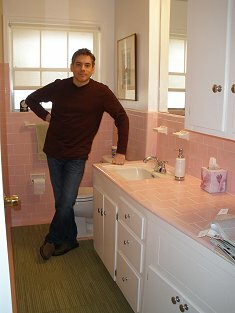 Your bathroom has a very luxurious layout (no cramming the tub, toilet and sink into one dinky space), and I find the mix of pink, white and gray tiles, and pink and gray fixtures, to be very charming. 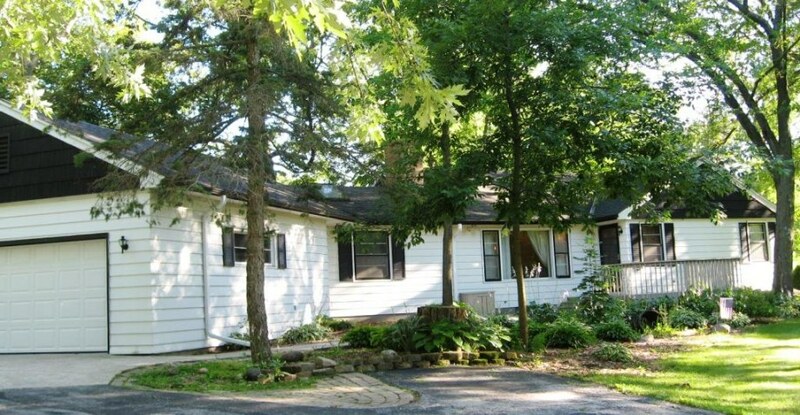 This looks like a home that has been maintained, and tastefully improved, over a lifetime rather than the “gut and redo according to current fads” makeover that seems to be all too common nowadays. I am especially intrigued by the fact that the original builders didn’t clearcut the lot, even with a basement in the plan! The exterior is very inviting as well. Would like to see the floorplan as well.